Last Friday I woke up in Indiana Jones mode. That means I felt an irresistible urge to go to see one (or two) of the many castle ruins we have here in Austria. Long story short, I ended up seeing three castle ruins only a few miles apart form each other. 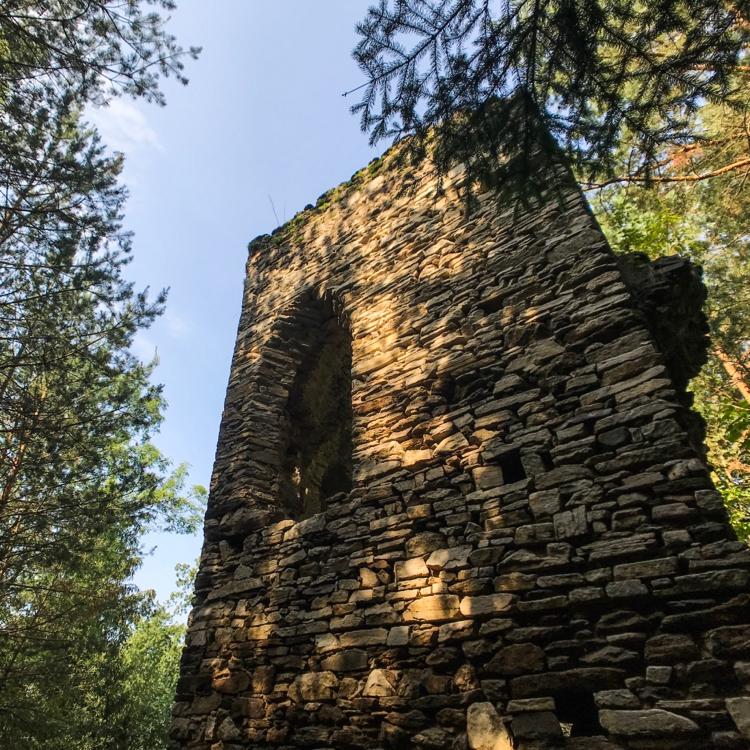 All of those ruins are located in lower Austria in an area called Waldviertel. So I put my tripod and a few bottles of water in my daypack and drove to the first of 3 castle ruins you should visit in Lower Austria. The first one is somewhere in the woods close to the Czech border. There’s not much left except a part of the churchdom. The Luden/Gaber castle was built around 1300 and was abandoned only 200 years later. So the castle itself is completely overgrown and a large part of its remains are below ground level. The most visible thing here is the dom of the church that once belonged to the castle. You can clearly recognize that it was once a church because of the typical frame of church windows. This dom is the first thing you’ll see when you approach the ruin. When you walk around, watch your step and keep in mind you’re walking on a buried castle! Mind the slopes that surround the churchdom and if you look closely you can even spot the walls of the former castles down there. Castle Eibenstein is the exact opposite. It’s a castle high up on a cliff right near a creek. It was built around 1200 and allegedly in use until the 30 years lasting that devastated large areas of Europe between 1618 and 1648. There’s only a small trail leading to the castle that will take you right into the inner yard from where you can explore other parts and rooms of the castle including then dungeon if you’re willing to climb a 6 feet stone wall. Use the rocks of the wall as stairs but be careful; they’re small! Once inside the room on top of the wall, head through the low gateway to explore other areas of the castle. Again, watch your step. There’s a 50 feet drop off to the right and a 9 feet drop off into other parts of the castle on the left. Note that there is no cell phone coverage in or near the castle! Castle Kollmitz is a managed castle ruin built around 1300 that’s maintained in a kind of arrested decay. What’s interesting here is the size of the castle and that, after it was abandoned, another castle was build on top of it. Unlike the other castles, this one is pretty safe to walk around. Make sure you go up the two towers from which you get a great view of the castle itself and the surrounding area. Castle ruins are fantastic places to photograph. Here are three tips for taking great pictures inside abandoned castle ruins. Light situations can be difficult in castle ruins. So you may want to use a iPhone camera app with manual ISO and shutter control or with a dedicated low light mode like ProCamera App. Make use of the difficult light situations. Look for lights and shadows. Gates, windows and missing roofs (look up!) can create interestingly lit scenes inside e.g. a dungeon. If it’s safe, try to get up to the top of a castle tower. 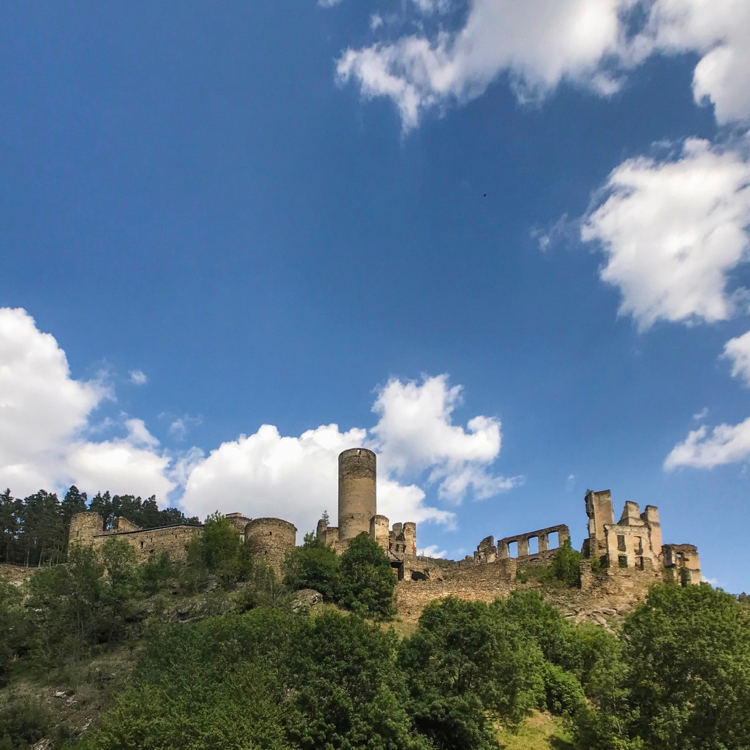 You may get a breathtaking view of the castle ruins and the surrounding area and even spot another castle ruin. Sometimes, castles were built in sight of each other.